Coach's Corner - Pink Floyd BAND-SIGNED/guaranteed mint electric guitar by 4 original guys! 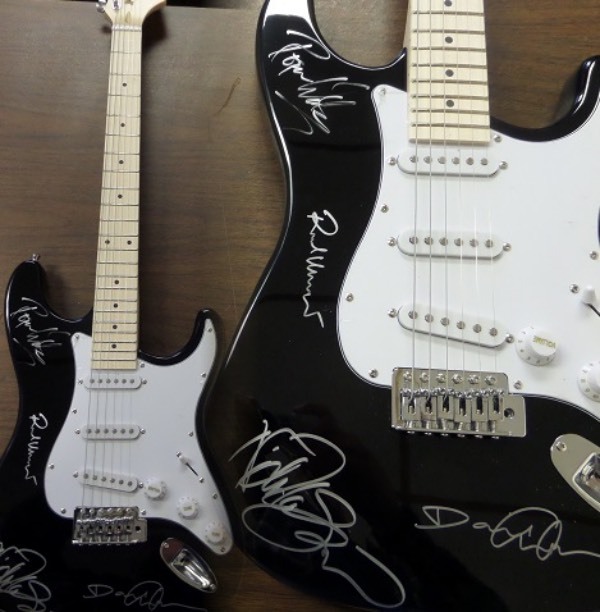 Go Back to Lot List Pink Floyd BAND-SIGNED/guaranteed mint electric guitar by 4 original guys! This GORGEOUS mint black electric guitar comes in the original box with all accessories included and has been signed amazingly well in silver by ROGER WATERS, DAVID GILMOUR, NICK MASON, & RICHARD WRIGHT!!! An absolute must for the fan of this legendary band and retails well into the low thousands. Guaranteed authentic.